Eliot wins the Elementary Round! On Sunday, March 19, the Needham community came together to test their spelling prowess at the 26th Annual NEF Spelling Bee. Over 30 teams participated, including elementary, middle and high school students, teachers, parents, members of Needham community organizations, and local business people. The afternoon kicked off with Kathy Curran, member of WCVB’s 5 Investigates, helping the middle school Treble Choir film a Wake-Up Call for Channel 5’s EyeOpener. The choir then performed the National Anthembeautifully to kick off the Bee. Throughout the ensuing six rounds of spelling, celebrity pronouncers Kathy Curran, Superintendent Dan Gutekanst, and Last Minute Productions partner Gary Gillis kept the event lively and fun. There was some fierce competition in the Elementary round, which was led by Superintendent Dan Gutekanst. At one point, Dr. Gutekanst consulted with Bee co-chair, Sarah Mesnik, about the possibility of running out of words! 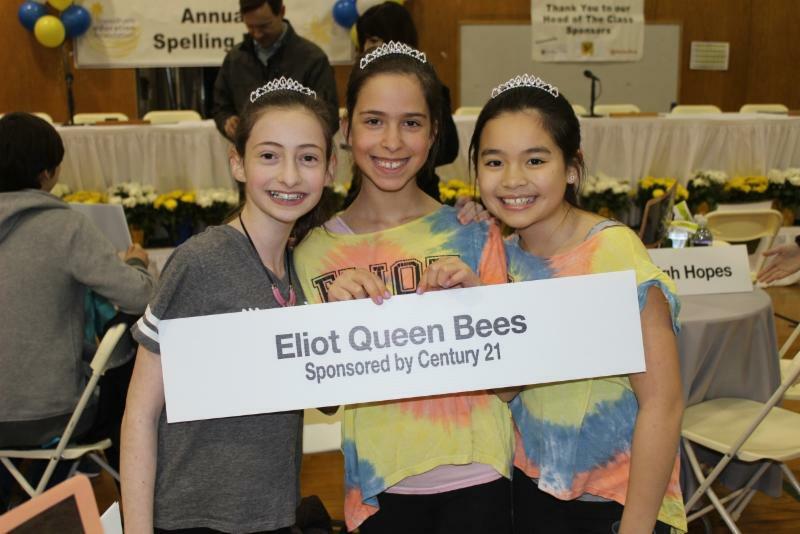 The Eliot Queen Bees Danielle Sockol, Talia Feeney and Taylor Chen ultimately secured the elementary-level trophy by correctly spelling “discrepancy”. The girls were so excited about their win, they opted to join in the Championship Round with winners of the other adult and older student rounds. The Queen Bees spelled several words correctly before they were knocked out of the competition! Great job Queen Bees! Library Bookies Take the Championship! 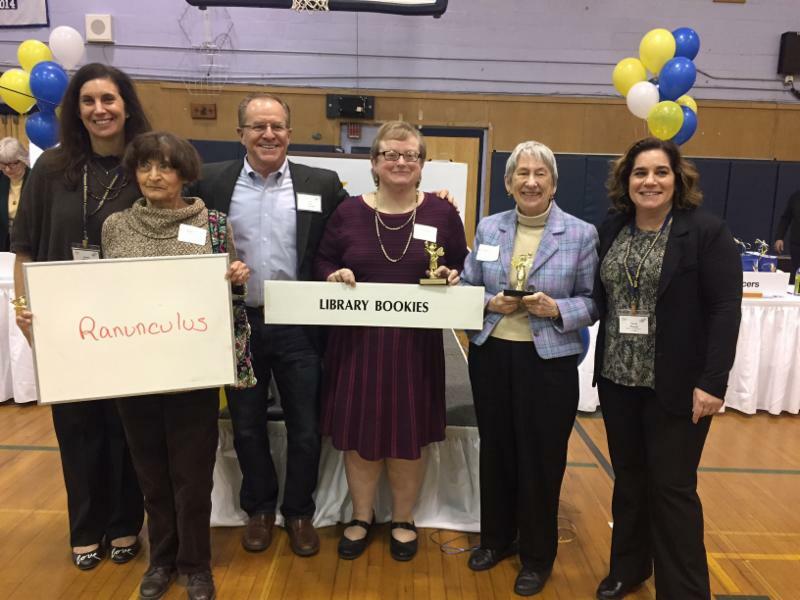 Joining the Queen Bees in the very challenging Championship Round were the Newman Pride teachers, the Needham School Committee, the Needham Finance Committee, and the Library Bookies from the Needham Public Library. Represented by Gay Ellen Dennett, Rose Doherty, and Janice Bowen, the Bookies were ultimately victorious when they correctly spelled the word “ranunculus,” which is a genus of plants including Buttercups. The Library Bookies are especially deserving of their bragging rights because they are long-time supporters of the NEF and the Bee, having competed at all 26 Bees! It was a fun-filled afternoon in support of the NEF and our mission to make learning come alive. Hundreds of spectators cheered on the spellers, enjoyed snacks provided by Roche Bros, and purchased Treat cupcakes and raffle tickets for great prizes from area businesses. We are grateful for all of the support! Check out the photo gallery of this signature event in the Needham Times!